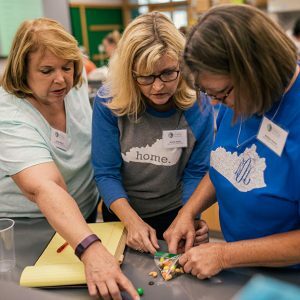 The UK College of Arts and Sciences teamed up with the UK College of Education to welcome middle and high school teachers to campus for the STEMCats Teaching Workshop. Teachers interacted with faculty during the daylong workshop sponsored by Howard Hughes Medical Institute in sessions including: Volcanoes, CrossCutting Concepts, Chemistry, Data Analysis Ideas, and Curriculum Conversations. The event took place June 8 at the Jacobs Science Building on the UK campus in Lexington.